By default all Pay-Per-View Order Confirmation Emails are sent via our email servers. To lower the chances of confirmation emails ending up in your clients Junk Mail Folders we highly recommend using your own Email Server to send these out. If you want to check out some Pay-Per-View Demos and extra information please visit our Pay-Per-View information page. Go to ⚙️ Settings > Miscellaneous 🔽 > Mails Server SMTP Settings. Here you will see a list of your current Customer Mail Servers. 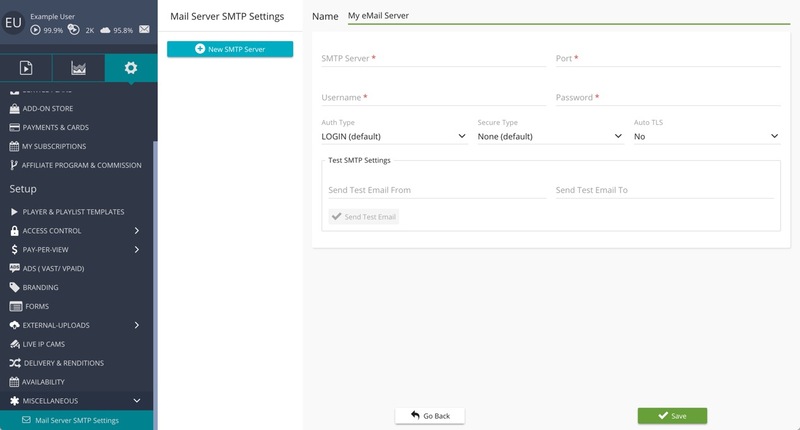 To create our new Remote Source you will need to click on the ➕New SMTP Server button. Name: Enter the name you wish to give to your SMTP Server for identification purposes. SMTP Server: Enter the address for your SMTP email server. Port: Enter the required connection port for your SMTP server. Username: Enter the username for your SMTP server. Password: Enter the Password for your SMTP server. Auto TLS: Set if you would like the Transport Layer Security to be set to automatic. Send Test Email Button: Once the sender and recipient addresses have been entered click on the Sent Test Email button to ensure the emails are being sent successfully. Now click on the ✅ Save button to save your Custom SMTP Server.